These socks are driving me nuts. I’ve been working on them for months, on and off (mostly off), and I’m done. Ripping’ it up my morning commute! I’ve made a deal with a fella from Calaveras County who has family access to a lot of figs: I knit him a hat; he will bring me figs! It’s months and months away from coming to fruition (literally), but I am really excited about this barter! We have witnesses to the deal. It’s on! We learn about cultural movements usually after they’ve happened. We are on the outside looking in and from the future looking back. When learning about beat poets, modern painters, and the like, I’ve been struck by the fact that various artisans were working individually within a greater social network and environmental context. Those guys knew each other? They hung out? They influenced each other? They’ve influenced their societies? I’m reading a book about them? Maybe someday I’ll read a book about a cultural movement happening in my consciousness: knitting podcasts. That’s right. Knitting Podcasts. I’ve witnessed the first wave. Some of the first wave have passed on. A moment of silence and well wishes for the makers of: Stitch-It, KIPing it Real, and Manic Purl (and Knitajourney who I didn’t listen to as much). These first wavers kept me company for oh so many stitches. You know what? Those gals know each other. They hang out. They influence each other. They’ve influenced me! I’m still listening to the steadfast first-wavers, waiting patiently for some to come off of baby-hiatus. I’m tuned into a few second wave favorites. I’m feeling hesitant to seek out the third wave, but I will. Any recommendations? During the break between my morning lecture and afternoon shopping spree yesterday at the Sock Summit, I rode out to Twisted on Broadway in Portland. Schacht’s Sidekick. I want one! 3-ply sock yarns are my goals this year for the Tour de Fleece. Abstract Fibers’ Superwash BFL in Sunset colorway on the Kiwi and The Royal Hare’s Superwash Merino in Blue Lake Lily on the Turkish Delight. I finished the wheel-spun project a few weeks ago. I’m still plugging away on the Jenkins Turkish Delight project. I just can’t put that thing down. More on those in a future post. 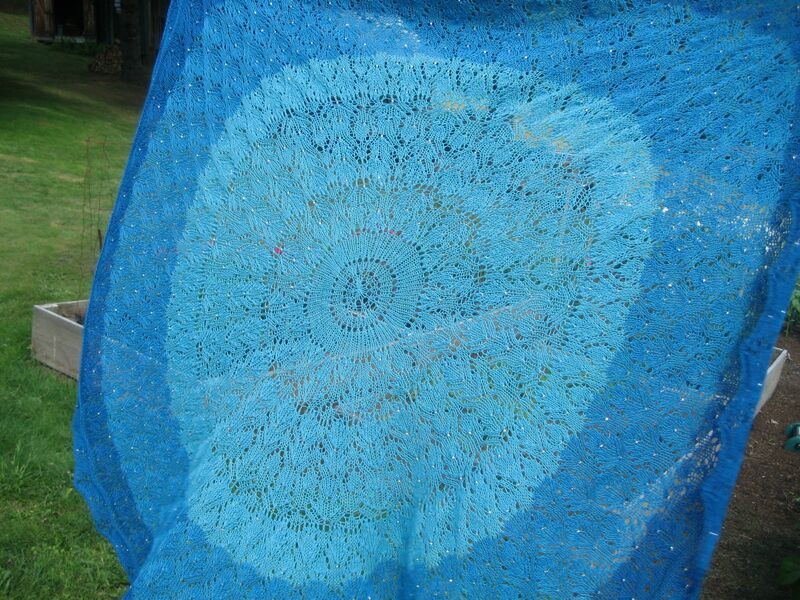 It’s based on Elizabeth Zimmerman’s basic Pi Shawl construction and uses a stitch pattern from Sivia Harding’s Aphrodite shawl design. It’s beaded with silver-lined clear beads that I got from General Bead on Minna Street in San Francisco. 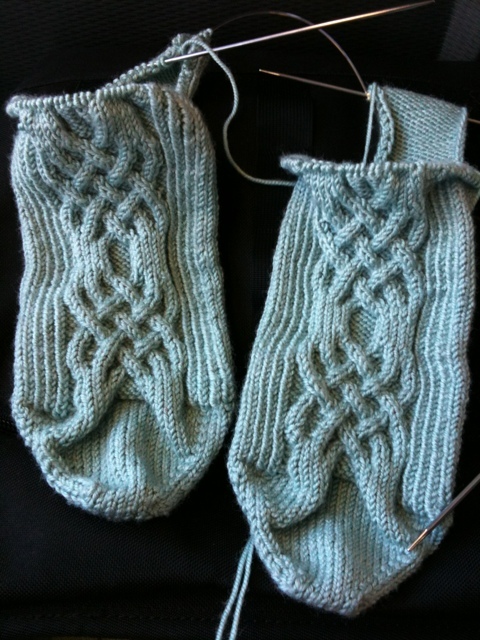 I really like the little bit of reverse stockinette that creates a garter ridge element at the border. It turned out pretty not bad. 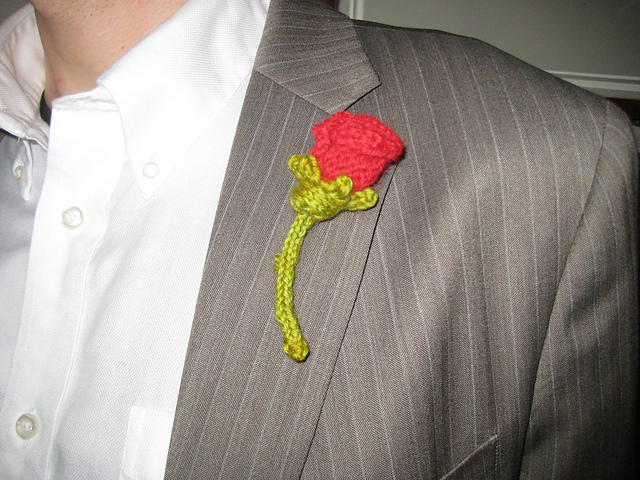 I made a knit flower bouquet. It was fun and ridiculous. It was like carrying a stuffed animal around at my wedding. The patterns for the flowers came outta the book, 100 Flowers to Knit & Crochet. 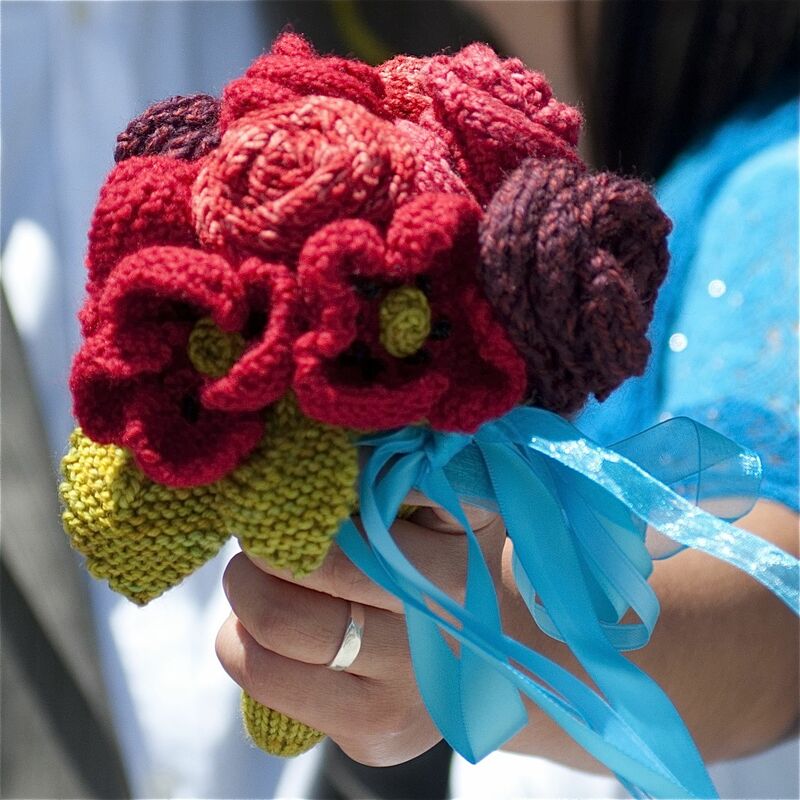 I modelled the knit stem base after this sweet little crocheted bouquet, but couldn’t bring myself to crochet (I tried, but I just didn’t like doing it). I stitched the flowers and leaves to the base, added some ribbon, and snuck an otherwise unloved DPN into the base to give the thing some rigidity. It gave me some smug comfort knowing that I got that DPN thru security at City Hall… like I was secretly brandishing a weapon of self-defense if the need presented itself. Once I got going knitting flowers (and I never ever thought I’d be knitting flowers), I decided to go into a small-batch production of little rosebud boutonnieres. They are sewn with regular sewing thread to basic medium size safety pins. They turned out pretty sweet.